Anyone who visits the Capuchin monastery in Palermo can not help but admit that he never saw such a sight. You realize at once that it is better not to say a word, in order to not disturb the sleep of the most beautiful Sleeping Beauty in the world. This little girl looks like a sleeping angel, a ray of light in the darkness of the underworld, with golden curls that cover her forehead, looking so authentic that she seems to be alive. An angel face, blond hair, chubby cheeks, a beautiful upturned nose, a yellow ribbon in her hair, some tufts on her forehead, a plump, angelic face, as if she was plunged into an endless sleep. 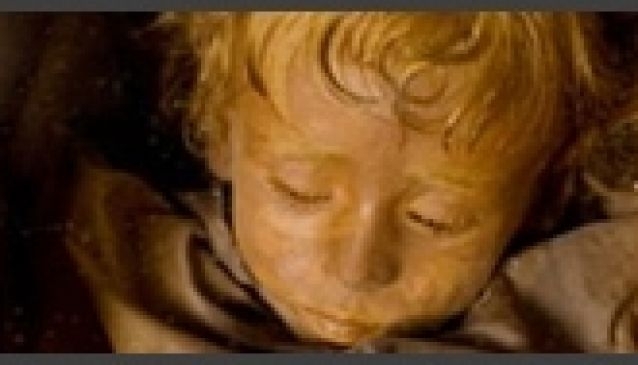 These are the features of the little Rosalia Lombardo, a Sicilian girl who died in 1920. Rosalia rests in Palermo in the Catacombe dei Cappuccini, at the foot of the saint with whom she shares her name.